In our last Reign of Terror spoiler, you learned about the Protoan and a few of their new mechanics. This week we are going to talking about the scavengers of the waste, affectionately known as Exsularian. Before we jump into the main course of new cards coming out, let us do a quick overview of the Exsularian as a faction. For those of you devout fans of the fiction, you may already know a little bit about this faction. The Exsularian get their name from being outcasts of Jotune society. During the purging known as Ultimundus, the Jotune exiled hundreds of thousands of citizens into the wastes of Sularia. Tens of thousands would die in the brutally harsh conditions post Fracture, but many would live. There were also survivors outside of the Jotune society that joined with these exiled groups. Collectively, they became known as the Exsularian. The Exsularian tribes under the guidance of the Council of Elders wandered the wastes fighting for every scrap to survive in the worst conditions possible. Many have evolved and mutated over the better part of 600+ years. Some believe that they have tapped into magical energies, found post Fracture, to harness powerful abilities that make them virtually indestructible. Others seem to be mutated beyond human recognition and have become something far different than their Jotune brethren. Others have suffered immeasurable pain and suffering due to their living conditions. But all are Exsularian and are survivors. The Exsularian lack the resources and raw firepower to go toe to toe with the Jotune or Synthien. Instead, Exsularians choose to tactically engage their enemies based off of advantages presented on the battlefield by either their opponents or themselves. The Exsularian featured inside of Reign of Terror, will find you doing exactly that. Opposing combatants and sites are simply not safe from the Exsularian’s tricks. 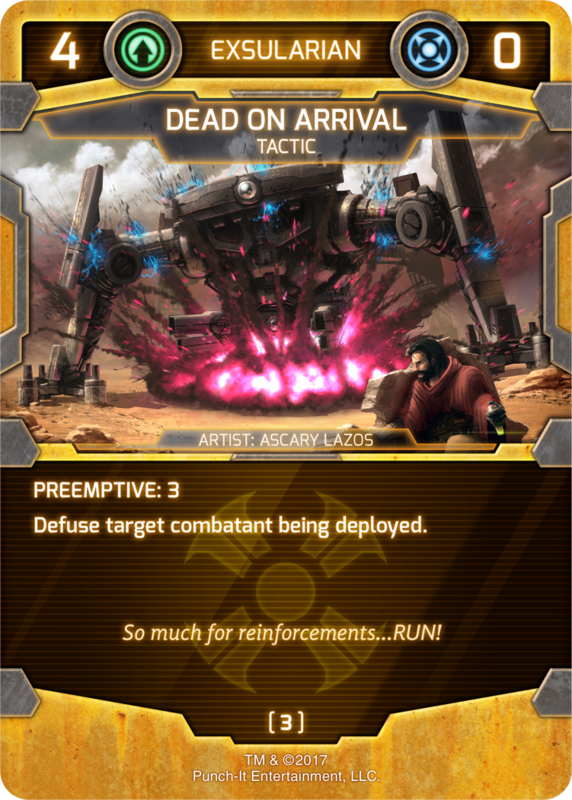 Dead on Arrival fits the bill on how the Exsularian intends to keep opponents off their game and give them the distinct advantage on the battlefield. Opposing battle commanders will have to be concerned that each combatant deployed is now at risk of never even surviving to attack or defend them. Not only is this a powerful loss of a combatant, but it also is a small form of resource denial. If you are playing Exsularian, be prepared to play around Dead on Arrival. Dead on Arrival also introduces a brand new mechanic into the world of Sularia. PREEMPTIVE gives a distinct advantage to the player going second in the game, or the off-initiative player. When a player is off-initiative, preemptive cards have their threshold reduced to the numerical value listed on the card. These slight improvements to the timing of a tactic have very large gameplay implications. This ability enables a tactic to reach unprecedented power levels when playing off-initiative. When playing against the Exsularian, it may no longer be advantageous to go first over them. PREEMPTIVE cards will push Exsularian opponents to drastically alter the way they plan to play the game right from the get-go when the initiative choice is made. While defuse has been discussed in previous releases, this is the first time we have actually seen it as a hard counter/removal card in the game. Dead on Arrival simply ensures that your opponent’s powerful combatants never see the battlefield. Removing an opponent’s combatants is powerful and necessary to the greater strategies of an Exsularian battle commander, but it does not serve as enough of a deterrent and additional control help will be necessary. In the last article, we showed the Agropholid Hatchery and in this article, we want to show you the Exsularian's equivalent site, Stockade. Stockade is a 2-influence cost site with a whopping 6-defense value. This site is both problematic and difficult for opposing battle commanders to deal with during the early game. Its real power is in the site’s ability. Each time a player activates Stockade they may activate a combatant controlled by their opponent with a sularium cost of three or less. While this site is not going to handle the largest threats of many of the factions, it can handle those lower impact but equally powerful low-cost combatants of the Jotune, Protoan, and even the support cast found in the Synthien. Combined with Dead on Arrival and Exsularian now possess the one-two punch to help secure their victory. While controlling the game is powerful, it is simply not enough, control cards do not push the player closer to a victory but instead push their opponent further from a victory of their own. The Exsularian player will need an outlet to win. That outlet is the ability to play a powerful combatant on the battlefield that have a real impact on the game. The Mutant Savage represents a powerful threat and one that can be used to continuously pressure down your opponent game after game. At 9-sularium, Mutant Savage rivals the Hekaton Warhulk in cost and potential impact without that pesky sularium maintenance. While the Savage does not have a ton of cool abilities, it provides a brand new characteristic associated only with the Exsularian. Ruffian is the Exsularian's version of the Jotune warrior characteristic. You can expect to find greater synergy with ruffian throughout Reign of Terror and further down the road as the game expands. As we now know the Exsularian are scavengers at heart and the last thing they want to do is pay full price for anything. They have learned to survive in the barren wastes for almost a 1000 years, and now that Sularia is healing they are ready to stake a claim for what they feel is rightfully theirs. Headhunter is a powerful combatant for the Exsularian that doesn't do the heavy combat lifting on her own but instead dials up exactly what the Exsularian wants for any given gameplay scenario. The fact that the Exsularian player can play that combatant for zero sularium is just incredible. At 6-sularium, Exsularian players are going to need to commit to that level of production, but if they can acquire those vital resources, success is sure to come. Opponents of the Exsularian need to be mindful of how to keep them from gathering 6-resources. Once a Headhunter lands on the battlefield, a very problematic threat is headed their way. Dealing with Headhunter is no small task with her built-in 6-defense she is problematic for many builds to eliminate. Additionally, Exsularian battle commanders should never discount the defensive wall that Headhunter can present to their opponent. She can make life rather miserable for opposing battle commanders both through her ability or through traditional defensive capabilities. That is it for this week’s article. We hope these four new cards found in our upcoming release of Reign of Terror have you as excited to play as it does us. We want to hear from you in the comments! What powerful things do you think the Exsularian might be gaining on top of the ones revealed here today? Are you more excited to play the Protoan or the Exsularian?